There’s always a slightly awkward moment when you talk to a room full of history enthusiasts about your favourite item in a Military Aviation Museum. For me, it’s not the Hawker Hunter in which Neville Duke broke the Air Speed Record, nor even the wreckage of a Hawker Hurricane shot down in the Battle of Britain. My favourite item, as I nervously admitted, is a pressed flower. These few flowers were picked by moonlight a few hours ago by the faithful friends you have in France. Hoping you will receive them in good condition. The family home of Anthony and Barbara Bertram, Bignor Manor, became a half-way house for agents in transit, and played host to a litany of famous French resistant names. Their son, Jerome, has compiled a wonderful book which collates their diaries, interviews and notes on that experience. 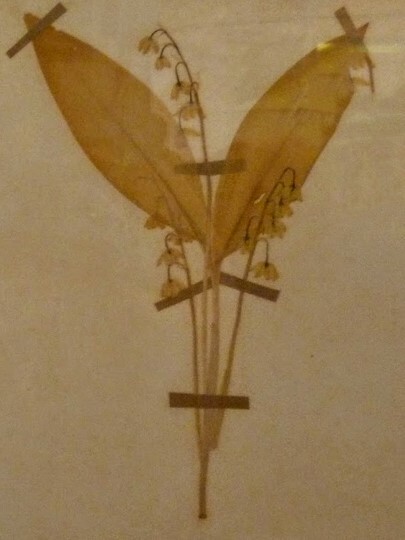 For me, those pressed flowers illustrate the importance of human connections in the logistics of war. They also informed how I thought about the flights that went from Tangmere into wartime France, and one in particular 75 years ago which we chose to commemorate. On the night of March 19th 1943, just over two months before the first meeting of the council that would knit together the strands of resistance in France, a clandestine night flight from Britain – codenamed SIRÈNE II – delivered the personnel who would realise that promise. As one of scores of daring moonlight operations from RAF Tangmere, this flight by F/Lt John Bridger’s 161 Squadron Lysander enabled Jean Moulin, Christian Pineau and General Delestraint to return to central France. The flight landed in the town of Melay, in the Saone-et-Loire. As an illustration of the continuing bonds represented by that flight, the people of Melay hold an annual commemorative service at a monument to the flight. In the 75th anniversary year, students from a local technical college restored a ‘moving memorial’: the same model of Citroen that collected Jean Moulin from the landing site. I found out more about this from the Mayor of Melay Jean-Claude Ducarre who kindly spoke with me over Skype. 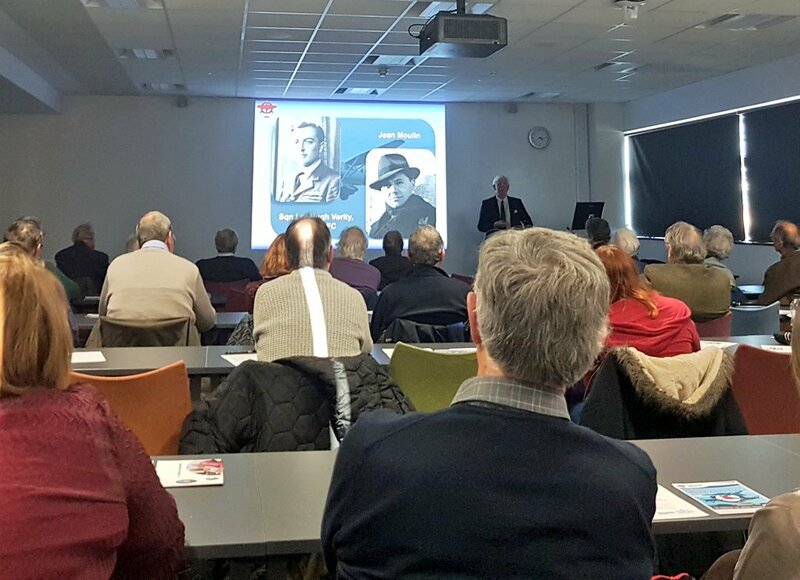 We talked about plans to commemorate the take-off of that flight at the University of Chichester (which had served as the Operations Room for RAF Tangmere), and how we wanted to have commemorative events speak to each other across the Channel. In a recorded address, he spoke of his recognition of the bonds between Britain and France, and his gratitude for the wartime bravery that kindled the flame of resistance. We played that address to an audience of those looking to commemorate the flights on 19th March 2018. We divided the event into three parts, looking first at the flight, then at Jean Moulin, and then at the legacy of those flights. 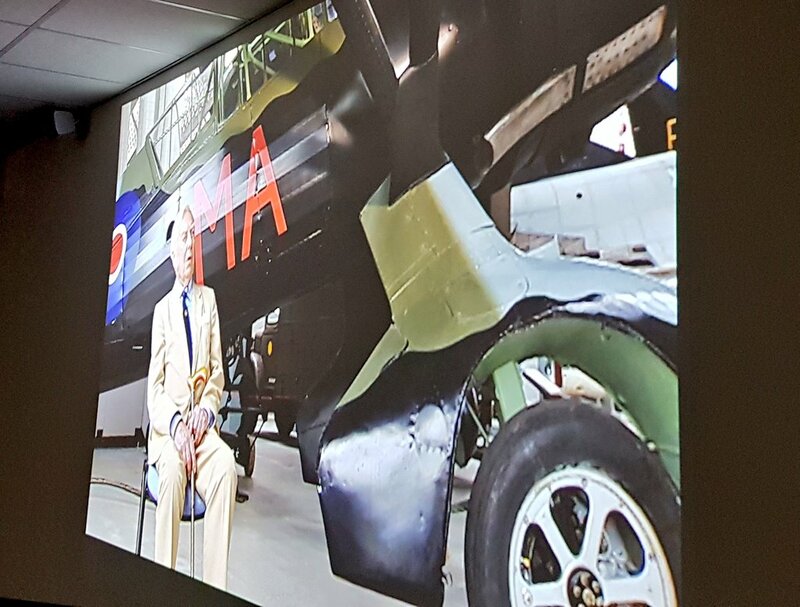 The Director of Tangmere Military Aviation Museum, Dudley Hooley, spoke about the pilots and their preparation, from the anxious moments spent waiting for an operation, to the experience of flying in a Lysander. Dudley gave a strong sense of the operational procedures that governed the flights, and about the story of the flight itself (which followed an unsuccessful attempt to return Moulin to France the previous month, which we commemorated in 2013). Next, Martyn Bell (one of the co-founders of the Secret WW2 Learning Network) spoke about Jean Moulin and his wartime role, giving context to the significance of the flight. Martyn brought Moulin to life, giving a sense of the man’s character and grit. Enriching his wartime cover as an art dealer we heard stories about Moulin’s own artwork and his passionate engagement with the arts. Even as Moulin waited patiently in Lyon’s silent streets before attending a clandestine meeting, he recalled the paintings of Giorgio di Chirico, which evoked the long shadows falling across empty thoroughfares. I then presented research from my recent article in European Review of History, ‘‘Eclipse in the Dark Years: Pick-up Flights, Routes of Resistance and the Free French’. It argues that these flights, organized by formal and informal external networks, helped to establish control of the internal resistance for de Gaulle and to lay the foundations of the Liberation. It stresses that these cross-channel connections were forged quickly in the realities of war-time London, and relied in large part upon the good relationships of individuals working across British and French services. That was what brought me to talk about the pressed flowers from Tangmere Military Aviation Museum. For me, they were a symbol of how personal cooperation and bonds (across the RAF, BCRA, SIS and SOE) made the attainment of shared goals possible. I was delighted to welcome the daughter of one of the SIS Conducting Officers who had coordinated the flights, John Gentry. His daughter Caroline helped me prepare my article, and the commemorative event provided an opportunity for me to say thank you in person, and for her to meet others interested in the legacy of these moments. These cross-Channel connections continued, and we finished our event by screening a short film prepared specially for the event by Martyn Cox (another co-founder of the Secret WW2 Learning Network) and entitled ‘Resistance by Moonlight’. He’d sent over the files from France, and the audience was fascinated to see interview footage with pilots, agents, evaders and others associated with the pick-up flights, as well as footage of Lysanders in flight and operations being planned. The images brought to life the descriptions and analysis of the flights that we’d heard, and rousing applause met the end credits. 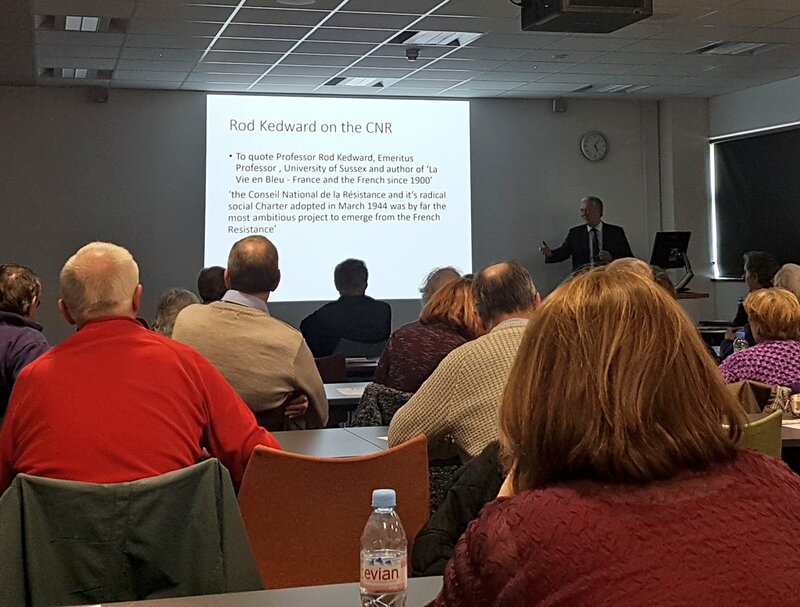 Afterwards, we were fortunate to welcome one of the most esteemed historians of resistance in France, Professor Rod Kedward, to offer concluding remarks. He spoke inspiringly about the vibrant and vital work of sustaining memory and forging new connections between people, reconnecting those bound by the memories of wartime resistance. At the end of the event, we echoed the annual ceremony in Melay, in which French participants proudly sing ‘God Save the Queen’. As a group, we rose to sing ‘La Marseillaise’, and raised a glass of wine from Béziers (Moulin’s place of birth) to toast the spirit of resistance and the memory of those involved in the flights. We also arranged for a copy of the programme to be signed by the children of those involved who had come along: the daughter of one John Gentry (one of the SIS Conducting Officers), the son of ‘Bunny’ Rymills (a 161 squadron pilot who flew these missions), and the daughter of Maurice Buckmaster (the head of F Section of SOE). 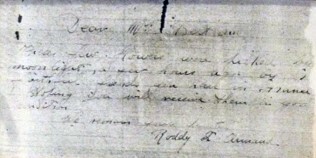 That signed programme is to be sent to the Mayor of Melay as a lasting symbol of the connections between our communities. I hope, in some way, that it will serve as a poignant reminder, like those pressed flowers, of the ways in which these routes of resistance shaped people’s lives.